It’s impossible to know whose eye quivered first. I am so lucky that the email era didn’t correspond to my nubile peak. I bet I’m not the only one thinking that—not about me but about them. I am, of course, referring to the emails revealing David Petraeus’s affair and destroying his career. I think it is a sad loss for the country, and it brings up all those ancient mythologies demonizing the feminine. Pandora was the classic, whom the Greek poet Hesiod described as the founder of “the deadly race and tribe of women.” Actually, Pandora had been the “All-Giver,” the Great Goddess Rhea, before she was reconstituted by the Hellenic patriarchy. And she had a vase, not a box. There was a photo of Paula Broadwell, the presumed seductress, in the newspaper yesterday, and she does kind of look the role. She sits on the front row during the CIA nomination hearing, an attractive woman revealing a little cleavage, shapely legs, and bare toes in her heels. We ladies know what those bare toes mean. Shock has been expressed about the naiveté and the imprudence afoot and often by people who have no doubt been lucky in this regard. There were things going on everywhere I ever worked, and I doubt that this has changed. With regard to Petraeus and all the other driven and gifted men who ascend to high-flying positions in the world, it can be lonely and stressful in the cockpit. They are human, and so are the ambitious women whose own gifts are a mixed blessing sometimes. It’s impossible to know whose eye quivered first. This whole thing has certainly put me on alert. It reminds me that any email I send could be forwarded without my permission to someone else. It reminds me that I need also to be aware when I’m communicating with someone who is working with institutional, corporate, or government technology. Gossip, anger, criticism, humor, and any other form of sharing now leave a “forever” track. I have learned to let any blog I post season overnight, and I have imposed a new rule about not getting involved in exciting ideas or controversial issues after a certain time in the evening. If something irritates me, like a nocturnal rat, I could bite. I have, in fact, lost sleep over communication that should have spent the night in draft form. Thanks to the Petraeus tragedy, I have taped a little card to my monitor with one word on it: “THINK.” That’s all-inclusive, of course, but it reminds me to pause and consider before I hit that “send” button. 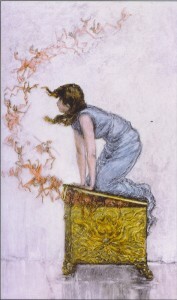 I don’t want to open Pandora’s Box—or mail it to anyone else.